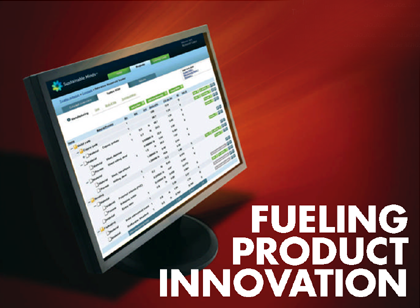 In the effort to create greener products, environmental performance software is but one piece of the puzzle. Sustainable product development requires new knowledge, skills, and processes - supported by technology and applied across the product lifecycle. This discussion, originally recorded on November 4, 2010 is everything we hoped to create in this new podcast series: intelligent, challenging, fun…and utterly devoid of marketing hype. Listen in as Nancy Johnson of Cadalyst moderates a panel including Ben Eadie, Chad Jackson, Oleg Shilovitsky and Chris Williams discuss PLM as you have never heard it discussed before. Robert E. Middlebrooks AIA, Industry Strategy and Relations Manager from Autodesk's AEC Solutions, gave a compelling talk on BIM & LCA. More than 1200 people attended! He demonstrates a great project he built in Sustainable Minds showing how he evaluated the impacts from a flooring system. 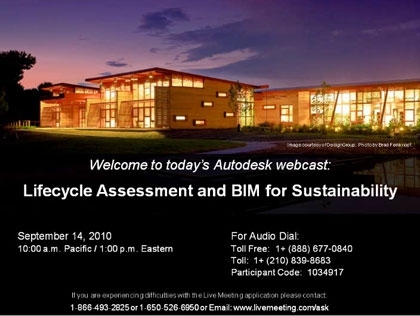 AEC professionals are well aware that designing sustainably is key to achieving environmental goals. Architects, engineers, construction professionals and building owners must focus on the best decisions during conception, design, construction and operations in order to support sustainability objectives. Since new buildings and renovation projects will serve their occupants for decades, the overall cost in resources and the environmental impact of operations and maintenance must outweigh the initial costs of construction. The first episode, featuring a distinguished panel of experts, focused on "Overcoming Environmental Performance Anxiety," a discussion that embodies the webcast series' ambitions of bringing a new point-of-view to the important issues facing the CAD and PLM worlds. November 4 | Webcast #2: Why PLM Hasn't Taken Over the World. Register at http://www.cadalystedge.com/podcast. Sustainable Minds’ Affiliate, Cadalyst, is launching a new webcast series with an edge, called “On the Edge with Cadalyst.” The premiere presentation, Overcoming Environmental Performance Anxiety, will discuss how going green can fuel product innovation and increase revenue. It airs live on October 14 at 12pm ET, 9am PT. Typical webcasts today might include a PowerPoint presentation or software demonstration and often conclude with a sales pitch. A new webcast series from Cadalyst, called On the Edge, will be nothing like that. On the Edge with Cadalyst will bring together designers, engineers, managers, executives, industry analysts, and hardware and software developers alike to exchange information, ask tough questions, and tackle issues that stand in the way of progress in the fields of manufacturing, AEC, and civil engineering. They’ll always come back to technology because that’s what Cadalyst is all about. But above and beyond that, this series will aim to be an innovative, open forum where people can gather to ask questions, answer questions, and even debate as they work toward the mutual goals of improving design and growing business. The editors at Appliance Design invited Sustainable Minds to explain how environmental performance is an innovation driver in product development.